Yesterday’s trip was good on crappie in 20 plus ft of water. Everything was caught on jigs with a slow presentation. The bite can be great at times and some nice fish are being caught. We are on a deep water bite that’s consistent and fast at times. we are also catching some huge white bass. Slabs and jigs in 20 plus ft of water is where there at. Hybrid Stripers - Some days are just fantastic, especially the bad weather days. Unfortunately on the clear calm days the hybrid bite has been slow. If you out on the higher wind days or the rain/sleet/snow days they seem to always be able to be found easier. We are catching most of the suspended about 20-30ft deep in 40-50ft of water this time of year. Just look for them on your graph under the birds or loons and when you find them start fishing the correct dept. Deep brush is the key on the crappie. Yesterdays 1/2 day trip was slow at times but steady enough to keep us busy, we ended up with a nice mess of fish. Some days will be better and some about the same this winter. If you catch a nice calm sunny day it can be great on the crappie. Hybrid Striper - Excellent on overcast & windy days. Slow/fair on calm sunny days. Bad weather days they love, call me if you’re brave enough to go out in the cold this winter. Post front conditions that are windy and wet they generally love. Our trip yesterday went well. Jigs & minnows over brush piles in 15-20ft was the best. We fished only brush piles and did well. I expect the crappie to move a bit deeper now that this cool weather has arrived for a few days. I don’t think the bite will slow down much for the next few weeks as long as the wind isn’t blowing too much we should catch fish. Lately the hybrid bite has been excellent. the birds have been working fish in the early afternoon in deep water. Sassy shads swam through the fish have been producing big hybrids up to 9lbs. 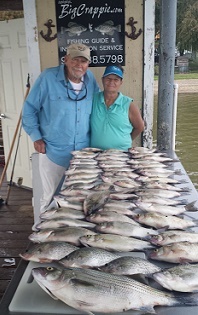 we have been catching limits of crappie on brush piles and boat docks in 15-20ft of water. Check put our picture gallery for pictures of our trips. Slabs in 15-25 ft of water bounced off the bottom is producing limits of fish. Main lake humps and points. Well it’s been a wet October as many of you know. We have had just tons of rain. It has been challenging dealing with the high winds and open flood gates at times but we have managed some really nice stringers of fish this month. 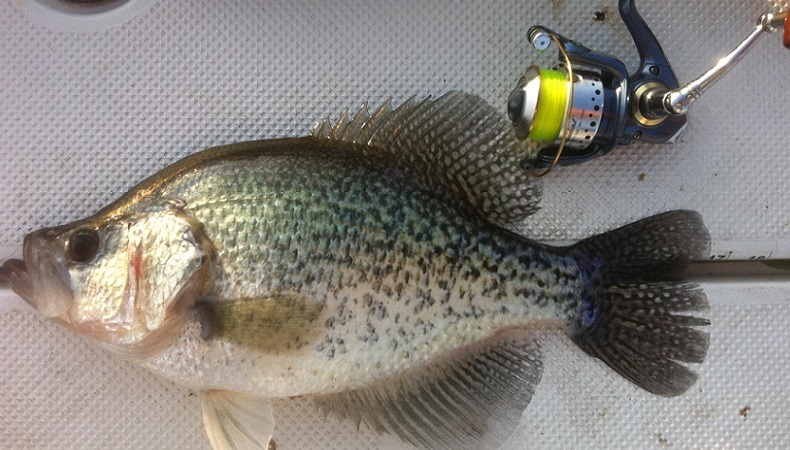 Crappie - Excellent, despite the tougher conditions the crappie are still doing great. we are catching them on brush piles in 10-20ft of water. Jigs on Mr Crappie 6lb line and 7ft Wally Marshall rods is what we are using. Boat docks and bridges are also holding some fish. White bass/Hybrid stripers - Excellent, cloudy over cast days the hybrids have been doing good and the whites have been doing excellent. Surface activity has been dependable on windy or overcast mornings. Clear days with little wind has been tougher. We’re finding them on humps and points in 15-30ft of water. We are using TNT slabs. I have openings for November; call now if you want to take advantage of the excellent fall fishing. 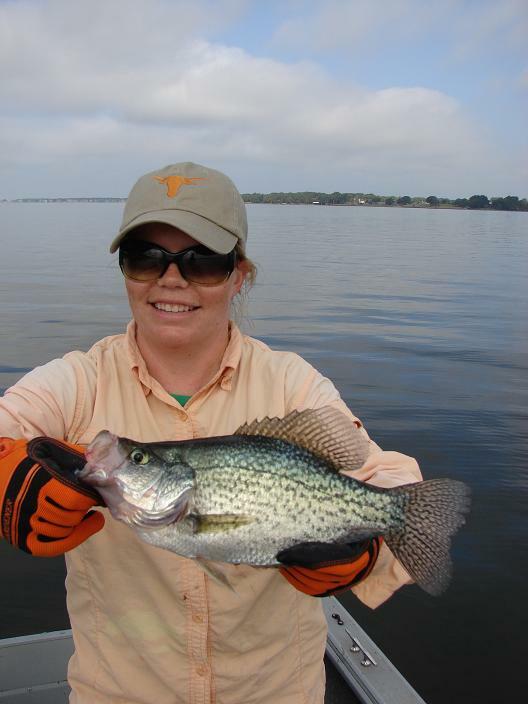 Crappie- Excellent, the crappie fishing has been nearly unbelievable. Brush piles on main lake points have been just loaded with big crappies. We are using 1/16 & 1/8th oz jigs on 6lb Mr Crappie line. Hybrid Stripers/White bass- excellent, surface action has been good early mornings on over cast days. On sunny days were finding fish in 15-30ft of water on main lake humps and points. Everything is caught using med action rods & reels with artificial bait. We are catching good numbers of crappie on brush piles and boat docks. We are using jigs tied on with 6lb Mr. Crappie line. Best depths have been 10-18ft of water. We are catching good numbers of fish on under water humps and points in 12-20ft of water. The surface bite early in the morning is returning with this cool weather. We are using TNT slabs in the chartreuse color. 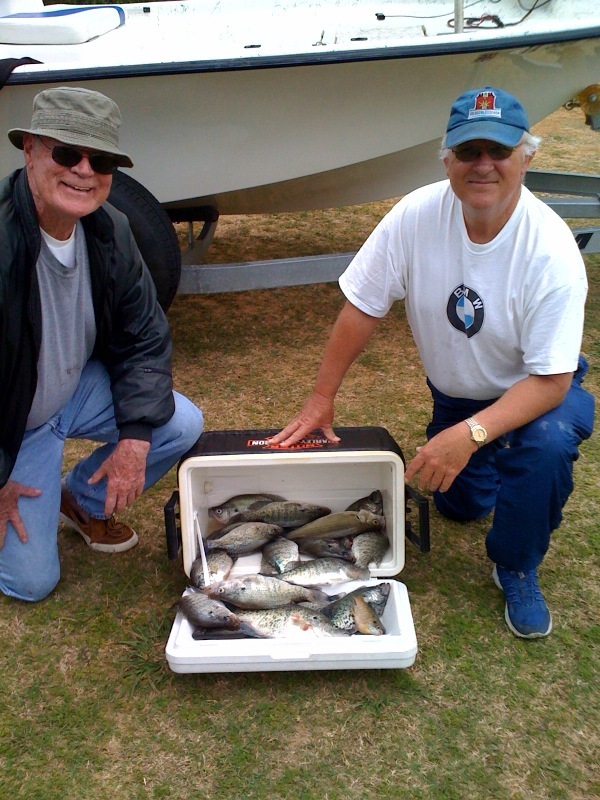 White bass - We have been catching limits of white bass on a regular basis. They have been stacked up in 12-18ft of water on humps and points in huge schools. Limits are common this time of year on big whites. Crappie - The crappie bite has been improving with each cool night we have. Brush piles and boat docks are going to be the big producers this month. We will fish mainly with jigs and catch plenty of crappie. The bite will still be very light and soft. Depth from 8-18ft are the best depths right now. Early morning surface bite on whites and mixed in hybrid stripers are common this time of year. It's fast action and tons of fun for adults and kids both. Fast action and hard fighting fish make it a blast! After the surface bite has stopped we find fish in huge schools in deep water. We generally drop jigging spoons to catch these fish but will occasionally troll if the fish aren’t responding to our baits. Either way you will have a blast and catch lots of fish. The crappie are doing better each week here on Cedar Creek. As the summer winds down each week will get better until fall. Today was excellent, we finished with 50 keepers. All caught on jigs in 15-20ft of water. The lake was calm and conditions were good. If your wanting a crappie trip call or email me and we will take you out and let some crappie stretch your line. White Bass - Excellent, limits of white bass are common this time of year. Were catching really nice fish right now. Some of the whites were catching are 15 inches long. Early in the morning were experiencing a surface bite. It’s a blast! fast action too! After about 8:00 am were finding fish in big schools on the bottom. Crappie - Fair/Good, if your only wanting crappie I recommend a full day trip for really good numbers. Although the bite is getting better the closer fall arrives. If you put in your time over a 4 hour trip a guy can keep 15-30 crappie. On a full day trip you could have 30-60 keepers. As the weather continues to get cooler at night the crappie bite will improve. Most trips until September will be just white bass trips. Although I will mix in some crappie trips with them. If you would like to come out and do a little bit of both please let me know. Crappie - Fair/good - We limited out with 50 slabs again yesterday on a full day trip. The bite is not excellent but you can certainly catch some crappie right now. brush piles and docks are the best producers. Expect the bite to continue to get better as the nights get cooler. White Bass/Hybrid Stripers - The white bass have been excellent. We have been able to find them on the surface frantically feeding almost daily. After the surface bite is over we are finding schools of fish on points and humps in 15-20ft of water. They are sometimes in huge massive schools. 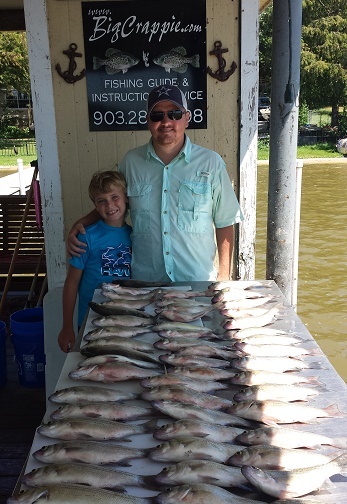 Limits are common this time of year with lots of action for kids. 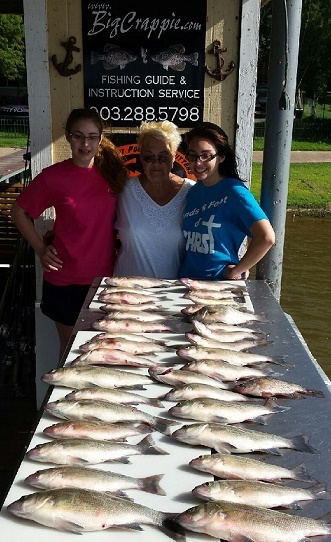 Call us to schedule your trip, were catching lots of fish! White bass/Hybrid Stripers -Excellent - Most days we get an early morning surface bite. The action is generally fast and offers beginners lots of action. After the morning surface bite or if the fish don’t surface we have to find them deep. That’s generally no problem either. We find them on windy points and under water humps in big schools willing to take our bait. 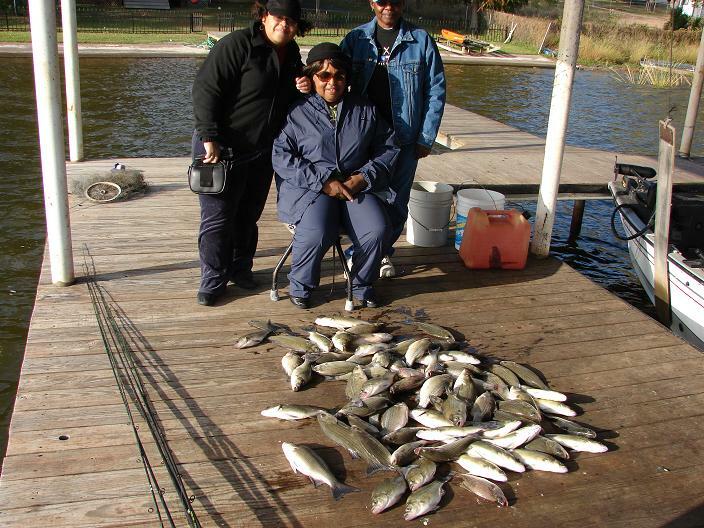 Limits are common but not guaranteed; if you want to catch a lot of fish give us a ring. We guarantee you'll have a good time. Kids are no problem either. We take out lots of kids and teach them how to catch fish too. I have three of my own so I generally do pretty good with them on the boat. Crappie - Slow/Good - We limited out on crappie this morning but that’s the exception this time of year. 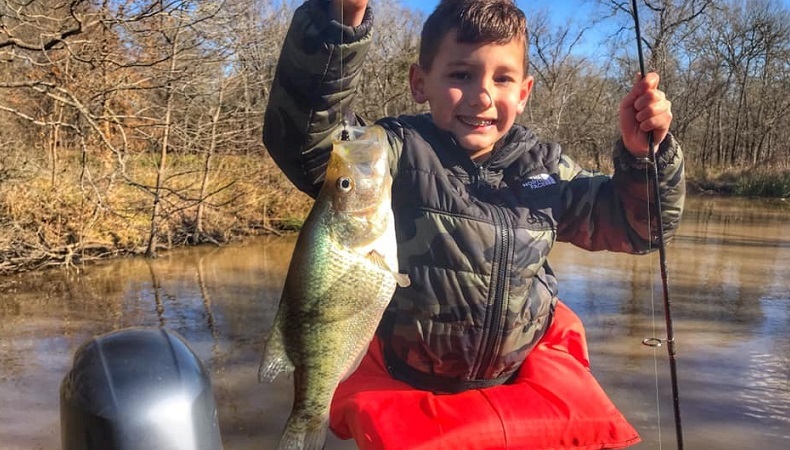 Generally the crappie are slow this time of year on Cedar Creek but if you want to chase them we will certainly try it. I don’t guaranty lots of crappie this time of year because they can be finicky at times when it's so hot. They will start doing well again in September. White bass - excellent - Morning surface bite followed by a deep slab bite. Limits are common. The white bass are big and fight good. Pretty good action most of the time. if you have a big party than this is the fishing you want to do. It keeps everybody busy. 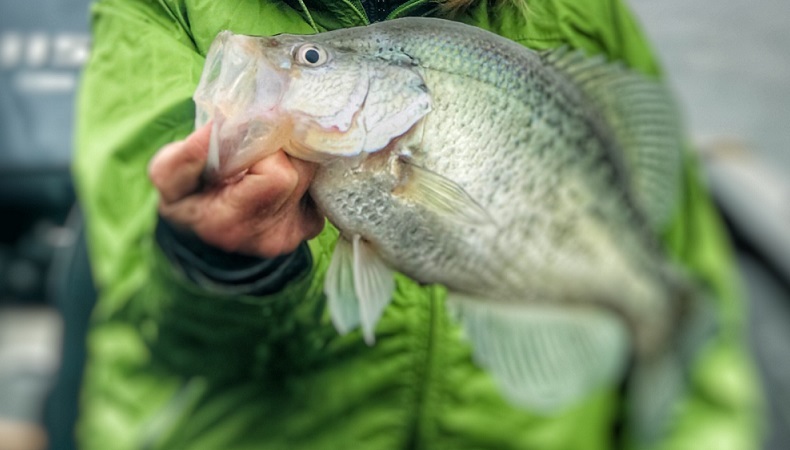 Crappie - Slow - The excellent bite we have enjoyed for so long has slowed down. We will still have excellent days but most days will be slow till the weather cools off a bit. I generally start running crappie trips again in September. For the next 6-8 weeks I'll mainly focus on the white bass. Crappie - Excellent - Jigs fished over brush 12-20ft of water. Color doesn’t matter just technique. If you’re not catching them then adjust your presentation and watch your line. The bite is excellent from about 8:30 am - 7pm. White bass - Excellent - Surface activity is awesome right now. Daily surface bite with feeding fish running the bait to the surface then exploding on it. Its fast action that can last 20 minutes or hours depending on the weather. After the surface bite is over we go catch them two at a time on points and humps in 15-25ft of water. This can be just as fast of action with no casting needed. We just drop our lines straight below the boat. Main lake points and humps bouncing 1 oz slabs. If you have never experienced the topwater action of big Cedar Creek white bass mixed in with big heavy hybrid stripers then you better come check it out. What a blast it can be! They just boil the water’s surface when they get going, it's awesome! Crappie - Excellent Jigs fished over brush tops in 15-20ft of water is producing lots of crappie. The bite is really good right now! We have been averaging good numbers of crappie on both 1/2 day and full day trips. 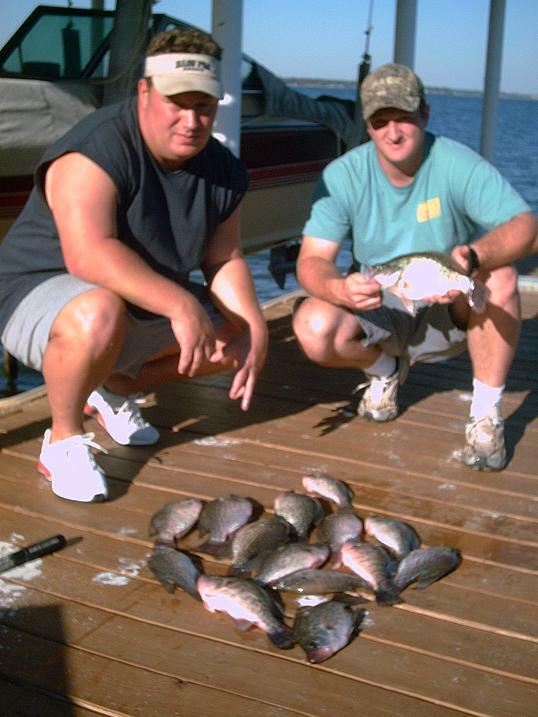 If you like crappie fishing then you need to call today to reserve your spot. White Bass/Hybrid Striper - Excellent - We are on an early morning surface bite that has been excellent. Every cast generally produces a fish when the fish are on the surface. After the morning rush we jig tnt slabs in 20ft of water and catch them. Limits of these fish are common. The action is fast! The fight is on! If you think the heat slows them down think again. We are catching lots of fish all day long right now. You can fish in the shade, I will raise my bemini top on the boat if you like. Crappie - Excellent/Spoil ya good - The crappie are on fire right now. We are catching lots and lots of crappie right now. Jigs or minnows fished from 10-30ft are producing lots of fish. 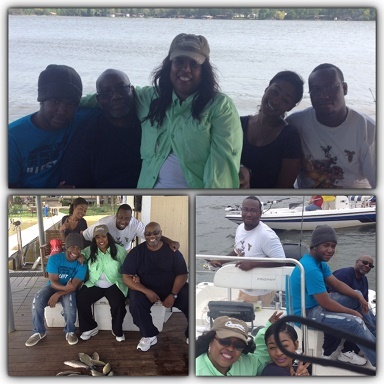 No down time, if were not catching them I am moving the boat. Most days there is hardly 2 minutes that go by while were fishing that someone isn’t catching something. White bass - Excellent - early morning surface activity makes catching them easy. Just cast into the schools and hang on. After the morning surface bite is over then we go to bouncing slabs in deeper water. Generally by 9am the fish are schooled up in big schools on points and humps and ready to be caught. Fishing for these fish is fun and hardly ever boring! Come get your line pulled on! The fishing is awesome right now! 12-17ft brush piles, boat docks, and bridge columns have had plenty of fish on them lately. Jigs fished slowly have been the secret. Any color has been working. We are using 7ft Wally Marshall rods and Mr Crappie line to catch all our crappie. White bass/ hybrid Striper- Early morning surface activity has been normal. The bite starts at 6:15 am so the early bird gets the worm on the whites and hybrids. www.TNTslabs.com is the bait of choice on our boats. The white bass season is just getting started. If you just want to catch lots and lots of fish then come now. The season pretty much lasts all summer. get your kids out and lets go catchin! Crappie - Excellent - Crappie are doing great! Jigs over brush piles and shooting jigs under docks are producing plenty of fish. Best depths are 5-15ft of water. Jigs in any color fished correctly will catch fish. White Bass/Hybrids - Excellent - The whites and hybrids have been doing excellent also. Surface activity on overcast days have been the normal routine. Big hybrid stripers have also joined in the action; we have been catching good numbers of 18-25 inch hybrid stripers. When they’re not surfacing we have been able to find plenty of fish on windy points and humps. TNT SLABS (http://www.tntslabs.com/Contact.htm) is what we are using to catch 99% of our fish. 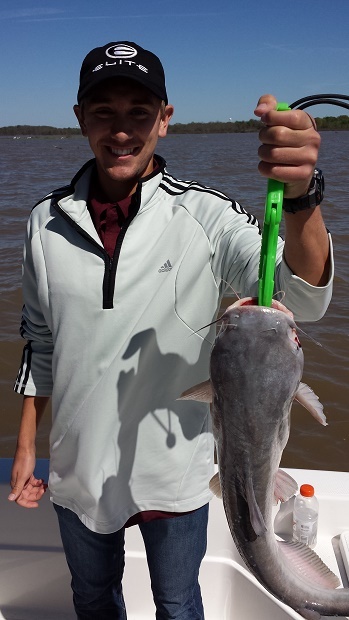 Catfish - Excellent - Cut shad in 2-4ft of water is producing 15-22 inch channel and blue cats. The lake level is about 10 inches high right now. All the gates at the spillway are open right now to allow the lake to come back down to normal pool. Crappie - Excellent - The crappie has been doing great on jigs in 4-15ft of water. Docks and brush piles have been our biggest producers this week. The wind has been our biggest factor for tough fishing this week. I expect the excellent crappie bite to last another 6 weeks. White Bass/Hybrids - Excellent - The whites and hybrids have been surface feeding early and late in the day on overcast days. We are getting in to the season now that the white bass will surface nearly every day. If you’re looking to just catch lots of fish these fish are the ones to chase. They school up in huge schools and are easier for the novice fisherman to catch. Limits of these fish are more common and they are great in the frying pan. The hybrid stripers have been mixing in with the whites again and we have been catching them on a regular basis when we are white bass fishing. Water temp this week was 65-71 degrees. Crappie - Excellent! The crappie has been doing great. 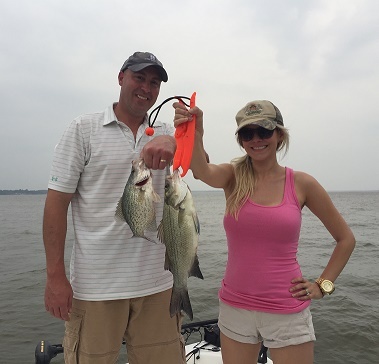 Boat docks & brush piles have been holding plenty of crappie. We have been able to catch them using Wally Marshall 7ft rods & reels with 1/16 oz jigs. The crappie are finally back in the shallows and biting excellent again. Crappie - The crappie are ready to make their big run into the shallow water. We have hit them hard several times this spring already but the cold weather changes stop them every time. As soon as the water hits that 65 degree mark they should start doing good again. We just need a couple of days of warm weather again. That’s what is great about April & May Crappie fishing is the more stable weather. I expect it to be an excellent spring with lots of big crappie. White Bass/Hybrids - The white bass spawn has been going on for about 3 weeks now. The bite has been excellent and we have been catching tons of fish. If your wanting to just catch a bunch of fish, these fish fit the description. They offer fast action & great fight on medium action tackle. Limits of big white bass (13-17inch) have been common the last few days. These fish have finally moved up shallow to spawn. We are catching them on tntslabs.com and humdinger baits. 4-18ft depending on conditions are the depth they can be found best. The crappie are finally spawning in the shallows. Boat docks, rip rap, and shallow creeks are the best place to find them. Jigs fished n 2-10ft are where we are finding them. If you patient enough to find where there schooled up you can catch some good numbers and good quality fish. The crappie have been steadily getting better. They are now spawning in the shallows. We have been catching them in 2ft of water the last few days. Jigs fished with 6lb line is what we are using. The crappie have been steadily getting better and better lately. We have had a good crappie bite lately. The wind the last week has made it tough but as soon as we get some calmer wind days we are going to start catching some big stringers of fish. Jigs in 15ft of water is the magic depth right now. The recent cold front has pushed the fish back into tighter schools and made them even easier to find. As soon as we get warmer weather again expect the best depth to get shallower. Afternoons have been really good. We have done the best in 15-24ft of water with slabs and 4 inch sasy shads. Late in the evening we have even had some surface activity which always makes it easier for us. I have 3 openings this week. If you want to go call now. The whites have been hanging out in 18-25ft of water. The last few days the bite has changed from slow to excellent. We have been catching tons of magnum whites mixed with some hybrid stripers. TNT Slabs and Sassy Shads have been the bait of choice. The fishing has been just amazing the last few days. Surfacing fish and fast action every evening have made fishing for these whites/hybrids a blast. Large Parties welcome, everyone catches fish! The bite on the whites has been good overall. They can be found in water from 14-30ft on the main lake body around humps and points. We are using slabs to catch these fish on the bottom. Slow technique is normally the best but yesterday we found fish in 14ft of water and caught them using a fast technique. That’s the sign that these fish are beginning to move shallower for their spawn in about a month. The bite should be excellent in about a month when the fish begin moving shallow. The crappie has been slow overall but we have been catching some really nice fish. We have seen lots of 1.5-2lb fish this winter, even one that was 2.75lbs. Jigs over brush piles in 25-40ft of water have been the best. Bridges will begin to start holding some fish pretty soon as the fish enter there prespawn pattern. Expect the catch rate to increase as spring approaches.